Got one eye open, scrambling to wake up. It was bright outside, jumped out of the trailer, everyone still asleep, can't tell what time anymore, it never goes dark. We set up the array before going to bed, left the array at a certain angle, guessing the location of the rising sun. Wow, it was perfect! No need to turn the car, went for a walk exploring the surroundings, there was a of forest fire in this area many years ago, time washed away some of the signs, most of the dead trees no longer show sings of the burn. Flowers sprawling and striving where before they wouldn't because the trees are no longer shading the ground, pretty to look at. A mix of beauty and horror of destruction, the inferno it must been while the fire was burning. Time now hills the land. We are just passing by. 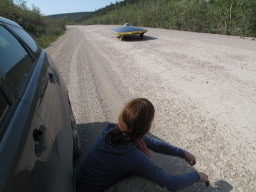 I made my way back to our 5 star gravel pit, bumped into Anne going for a walk, Claire was just finished rotating the car to better angle it towards the sun. Well done Claire! Far in the horizon we see what seems to be Eagle Plains. Claire, Anne and I ready things while Laura and Josh struggled to raise from their comatose states. Up an atom!!! Anne rally the team. On the road again! We weren't as close as we thought from Eagle Plains, 40 Miles away. The drive was pleasant, I kept looking out hoping to see the wolf I saw last year, got the urge to stop at the same location but instead just drove past. The wolf is out there, I feel a connection, perhaps it was just wishful thinking. One day I'll came back to look for her (we think it was female). In Eagle Plains, Emily asked me to send her a copy of the photo with the wolf, she think she may have seeing it a few months ago, made me smile as if was getting news about an old friend. Not too far from Eagle Plains there was some work being done on the road, calcium, water, soft mix of gravel and dirty made for a challenging drive. The narrow road became even more narrow with the pile of dirty in the middle of the road became a divider, driving on the right side, then on the left, when the divider became small enough I made an attempt to cross to the right side only to get stuck on it. Fortunately, Claire and Anne were right behind, I got out of the car and we managed to get it across. 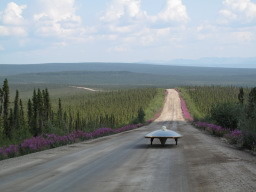 One of the many hazards of the Dempster highway. When we arrived at Eagle Plains, the first order of the day for me was to get the solar car fix, the damaged rim from last night, the broken bolt stuck inside the aluminum block of the support array arm. I talked to Stan the owner of the Eagle Plains lodge, showed him what I need and everything got fix as quick as it got damaged. 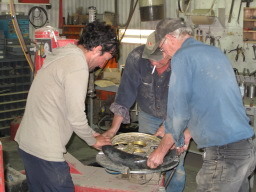 Using a rubber mallet Stan banged away the dents on the rim while Norm and I hold it in place. It's was just like new! Well done Stan! 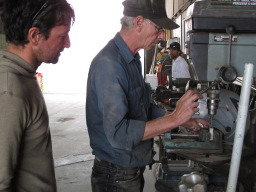 Next, Norm drilled the bolt out of the aluminum block, it was stuck. In the mean time, Anne took on the role of feeding everyone, ordering meals. Thank you Anne, glad to have you on the team. Anne, Josh and Laura went inside to eat, check their emails, Claire baby sitting the car. It didn't take long the car was back together. 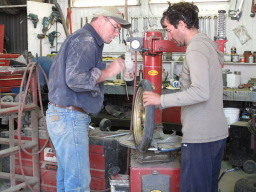 Wheel replaced, array lifting arm working again. The only thing left to fix now is the front mounting plate. It require some composite work, it will have to wait for an opportunity where the car is still for 24hours, my work is cut out once in Inuvik. Finally got to eat putin :) Sadly, I heard the chef passed away 5 days ago. My condolences to his family. We took the time to check emails, shower and even got a full thanks of gas donated by the Eagle Plain Lodge Restaurant, Thank you Stan. It was a sunny day. However, the charging was slow, we weren't getting much energy, it wasn't enough to fully charge the batteries. On the road again at 23:00, the count down began. Anne and Claire driving on Anne's car and I stopped to wait for Laura and Josh driving the support vehicle to catch up to us, took the opportunity to choose tunes for a happy arctic dance, last night Anne played "lets dance" from David Bowie, I thought it would be appropriated, she played us her favorite song from boarders of Canada for us to hear. Artic Circle in sight, a quick stop to take more photos, Claire the mountain goat climbed on top of Anne's car. 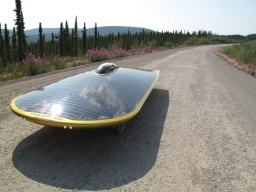 They quickly jumped ahead of the solar car, at the marker the anticipation was great, at Arctic Circle marker just past the midnight hour, photos, cameras rolling, a quick drive around, we danced in a frantic celebration!. 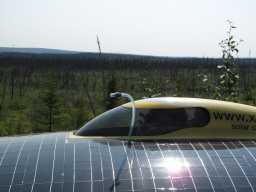 What a sight it must been, the solar car and a group of people dancing, making weird moves, jumping joyfully. A car passing by stopped to check it out, they were taken by the commotion, more photos and filming. On the road again, crossing the tornado alley was a taunting task, the wind was blowing hard, it lift the top of the car, I stopped to get it secure and wait for the support vehicle to catch up. Asked Josh and Laura to dive ahead, they disappeared, leaving us behind, we only rendezvous with them two hours later near the boarder with the NWT. Heavy clouds above darkened the sky, started to rain, the drive became even more challenging, the road got muddy, the car was fish tailing, slowly it managed to climb a couple of steep hills. I have driven on that same stretch last year when it was somewhat muddy, this time it was muddy, wet, very slippery and dark. The rain stopped, the sky cleared. Near the boarder of the Yukon and NWT the view was spectacular, landscape of another planet. Wow! We pressed on driving a bit further, batteries getting lo, we made a stop at the first suitable place on the side of the road. Early morning hours, the sky was clearing, it was a long day. We were all tired and ready to go to sleep. We crossed the Artic Circle! Pancakes, eggs, and toast. Hashbrowns, bacon, and coffee. Thats what kept Anne and I going driving through the wee hours of the night before. She reminded me of my sister and I who share a genuine, expressed enthusiasm for eating and sleeping. I know most people enjoy those things, but I'm pretty sure we like them a little more thanthe rest of the world. So much so that we can be found doing a little song and dance in their anticipation and clapping upon their arrival. Chefs and Waiters love us. On the drive we were taunting eachother with the the possible menu items that were waiting for us at Eagle Plains for breakfast the next day, building fantasy breakfast of solar champions. Ever since we stepped into the world where the sun never sets, we set up the array once we arrive to our campsite and then go to bed, leaving the array to collect the sun while we hide from the sun in our sleeping bags. I was disappointed to learn that we only had 95v charged when I got up around 10. It's actually a very realistic and concievable charge, but I was hurt by the fact that the car didn't seem to care about me getting pancakes. 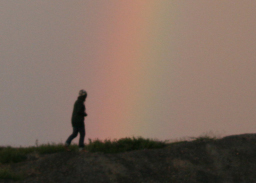 I rotated the array and turned around to see Marcelo and Anne walking back through the pinky field of fox tail. With Eagle Plains rumored to be in sight, we departed with maple syrup on the brain. Turns out that Anne's hungry eyes were outright hallucinating when they picked "Eagle Plains" out close on the horizon, a concession she beat her empty belly about throughout the three hour drive before reaching the food filled oasis. Notic to all of our surrogate solar mommies and my dad: we have plenty of food in the trailer and never go hungry (for real), but I fall victim to talking about food instead of articulating how to save the world and what not. 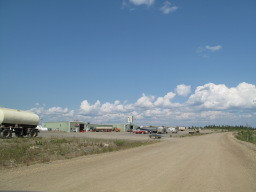 The ride to Eagle Plains was great, I rode with Anne and trailed the car with my camera always in hand. Between climbing on top of the car for a shot and assisting however with the car, we praised the wild world we were treking through, talked of topics of the non-solar world (which I'm quite sure still exists), and jammed out to Dempster worthy soundtracks, Gypsy Kings, some Balkan band, Cash, Young, Alabina, and Boards of Canada. I was partially surprised with the lack of wildlife sightings. We were spoiled in north BC and Yukon with moose, buffalo, and bear loitering all about, but the few sightings we did have were nonetheless memorable a couple HUGE beaver dams, a black bear, moles, ravens, and cranes. The most impressionable though was seeing a couple of soaring golden eagles and a mystical snowy owl. I can't get the sight of that regal owl out of my head. The consruciton crews and truckers of the Dempster made the ride so much fun. They would laugh and wave or give a pumping thunbs up as they passed. Two truckers even pulled over and waited for us to ride by to say hi and take a picture. With infamous stories of loose gravel, drop off shoulders, and muddy uphill climbs tucked securely in the back of my mind, the highway thus far had been better than I anticipated. 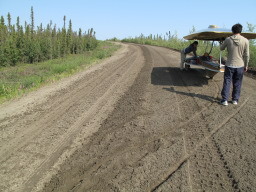 Our first real challenge, beyond shattering several world records, was a stretch of freshly laid gravel/dirt. A tractor moved along one side of the road rolling out a fresh layer, pushing left overs into a 1.5 foot high pile going through the middle of the road. There were rocks and muddy blocks the size of baseballs. On a long climb up this soft road, Marcelo narrowly maneurvered around a dirt chunk the size of a basketball before the rear wheel dug down, anchoring any attempt forward. Anne and I got out and stomped/danced on the dirt median, packing a section down, and then pushed the car over to the other side of the road. Getting dirty can be so much fun. Fireweed lined the road as we closed in on Eagle Plains, nature's red carpet entrance to an eagerly anticipated checkpoint. Stan, owner of the Eagle Plains facilities, was happy to see us and did not hesitate to help us with our maintanence needs, sponsored showers and a tank of gas. We set up the array and I babysat the car while Macelo went to the mechanic shop and the others set up our afternoon office in the restaurant. It was a very productive afternoon, mechanically speaking, the bent up rim was straightened out, the tire was patched, and a very important, not-so-standard bolt of the support frame was replaced. We ate, showered, updated, and charged until a staff member told us that the place closes at 11pm. "what time is it now?" "11." Knowing how close we were to the ARTIC CIRCLE, I was eager to start our long, bright night drive. 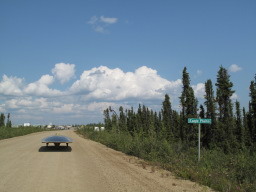 Crossing the border from Yukon to Norhwest Terra great internal thrill. I have a cartoon map of the world in my head with a red line following my lead, up and up and up!! Finally reaching the Arctic Circle at 1:30am was such a RUSH. "WE MADE IT TO THE ARCTIC CIIIIIRCLE!" Josh echoed through the valley. We cranked up David Bowie "Under Pressure" and "Let's Dance" (or something) and danced and screamed and laughed as the car pulled in and ripped a circle around us before stopping for the most treasured photo opp of the tour. WWWWWWWAAAAAAAAAAAAWWWWWWWWWWHHHHHHHHHHHHHHHHOOOOOOOO I MADE IT TO THE ARCTIC CIRCLE! A DREAM I NEVER KNEW I HAD!!! oh that was so great. 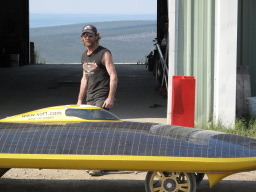 First patch on a solar car time, well done Stan! Thank you Eagle Plains Lodge! 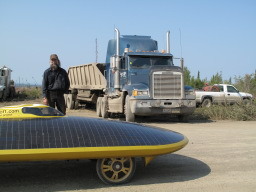 Most trucks slowed down on came to a complete stop while crossing paths with the solar car. Safe travels everyone! is the storm heading our way?